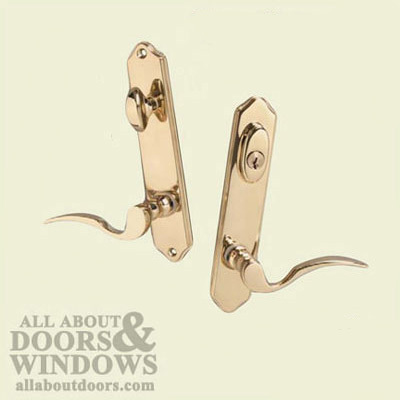 Brass hardware is designed to complement the design of your door or window—to cast reflections from its polished finish and to provide years of service. Brass, an alloy of copper and zinc, is polished and sealed with a clear coating by the manufacturer. When polished brass is not protected, it will tarnish and oxidize. This oxidization is a natural process that occurs when the elements contact the unprotected brass. The coating that is applied by the manufacturer to the brass hardware may be subject to a degree of damage due to everyday use. This could be caused by normal scraping of rings or house keys on the handle during daily use or the transfer of paint thinners, lotions and other reactive foreign products from hands or nearby projects on the door or walls. In addition, ammonia-based cleaners will also deteriorate the protective coating. If normal wear-and-tear, sea spray or deterioration breaks through the coating, the exposed brass will oxidize and need to be refinished. Brass has an enduring quality and can be refinished to its original polished finish over and over. The brass refinishing process is relatively easy. Remove the hardware from the door so the finish of the door will not be affected. On a newspaper-covered surface, brush the handles and plates with lacquer remover. After the coating is loosened, use grade 0000 steel wool to remove the coating and to polish the brass surface. Rinse the lacquer remover from the brass with a mild soap solution. Apply a high quality, non abrasive, polymer-base automobile wax to seal the surface. Alternatively, you can apply a spray lacquer, but this is more likely to flake off down the road. Though waxing requires continuous care, spray lacquer tends to be a bigger mess to clean up later. Re-install the hardware on the door. Periodically hereafter, the door hardware can be buffed with grade 0000 steel wool and waxed in its installed position. If your solid brass hardware is PVD Brass, it is considered lifetime-quality and the brass should not need to be refinished for at least 10 years. However, it is always a good idea to clean and polish your regular and PVD brass hardware. For instructions on how to clean your brass and PVD brass, read our guide here.